They say emulation is the sincerest form of flattery, and in Korea, idolatry of celebrities is scaling such peaks that even grown men are basing what and where they eat and drink on the habits of their favorite screen and singing stars -- with the stars cashing in on the new trend. Having lunch at Song Seung-heon's restaurant, a café latte at So Ji-sub's coffee shop or some nibbles at Tony An's snack bar are all becoming new social habits in Seoul as men and women in their 20s and 30s copy what they see their heroes doing on TV dramas and elsewhere. And as fans are increasingly modeling their daily habits -- not to mention their wardrobes -- on their favorite celebrities in a bid to get closer to them, new forms of franchise businesses using movie or sports stars are popping up. Not to be left out in the cold financially, the stars are not just serving as models, but are actively operating and managing many of the branches as investors. 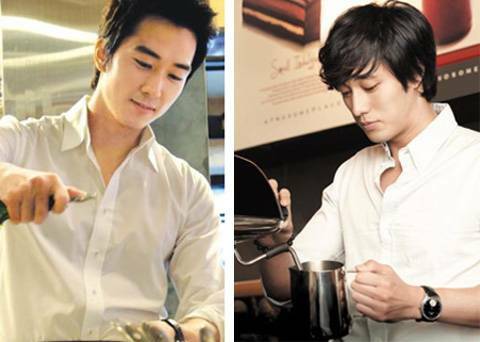 Actor Song Seung-heon has emerged as the first owner of a branch of Italian restaurant chain Blacksmith, launched by Caffé Bene. Korea's leading coffee chain started the new restaurant chain at the end of last month. The outlet in Seoul's affluent and trendy Sinsa-dong area opened on Dec. 22 with Song at the helm. As he frequently visits and takes care of updating the menu, the restaurant has already made a name of itself on the blogosphere and through Internet forums without needing to resort to any special promotions. And as the news spread, another Blacksmith in southern Seoul's Gangnam area directly managed by Caffé Bene brought in total sales of W17.6 million (US$1=W1,155) on Christmas Day alone -- twice the regular amount of branches this size. This indicates that the association of the brand with a star like Song has quickly attracted consumers and built up interest and confidence in the brand. Meanwhile, in Apgujeong-dong, actor So Ji-sub is running a branch of CJ Foodville's A Twosome Place. Testament not only to the actor's pulling power but also to his business savvy, the "Shakerato vanilla latte" that So suggested was introduced at 200 shops across the country last month and became the No. 1 selling item. His citron ginger tea has also become a bestseller at all of the outlets. "Star owners are getting a positive response from consumers because they have shown their adroitness as businesspeople by coming up their own ideas and actually working in the field, not just offering their images as celebrities", said Kim Mu-jong, a department head at CJ Foodville. According to the Korea Franchise Association, the franchise market in the country is expected to grow to over W95 trillion this year. Some 2,700 companies are members of the association, and the number of stores has already swelled to more than 300,000. As the competition between franchisors grows ever-more fierce, they are trying to attract major stars to differentiate their brand image. But maintaining the business afterward is just as important. The danger of relying too much on star power was evident with the failure of the U.S. restaurant chain Planet Hollywood, which was launched in 1991 with top stars like Bruce Willis and Arnold Schwarzenegger investing in it. The seemingly foolproof business went bankrupt within eight years. "Star marketing has been proven to be effective in raising brand recognition and its competitiveness", said Kang Byung-oh, an adjunct professor of Chungang University. But when the star's image falls, the brand image is also damaged, he added.